Looking to binge watch your way into the new year? 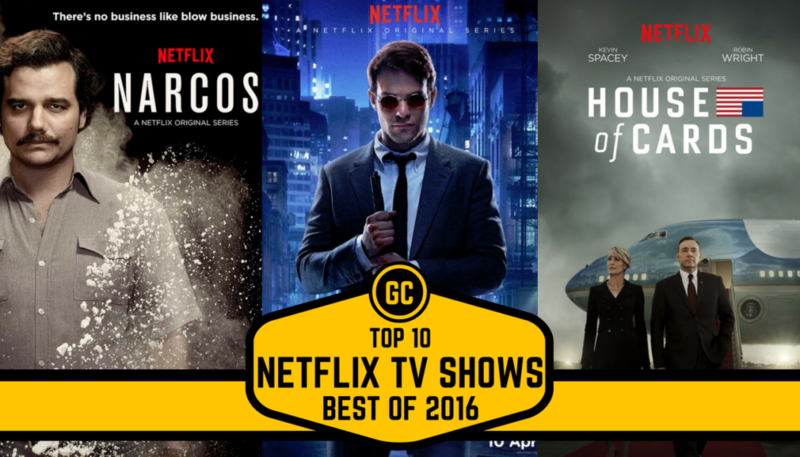 Here are the Top 10 Best TV Shows On Netflix of 2016! The show is about a group of friends who befriend a lost girl and the mysteries that she helps them unlock. Fans all over the world adore Eleven, the girl, and once you watch the show you’ll love her too. The show will be a special treat for those who enjoy Stephen King’s works. This show starring Aziz Ansari deals with his experiences of growing up as the son of an immigrant and various other humdrum aspects of his life.Of course, his wacky sense of humour brightens everything up. The show famously features Ansari’s actual parents. This show by Marvel covers the adventures of Matt Murdock, who is a lawyer while the sun shines and a vigilante when night falls. He was blinded in an accident as a child and uses his heightened sense to hunt down the criminals in Hell’s Kitchen. This show is based on the book of the same name by Douglas Adams, who also wrote the Hitchhiker’s Guide to the Galaxy. While it deviates from the novel, fans of Adams will recognize the weird humour. The show is about Todd and the changes that happen in his life when he meets Dirk Gently. This gritty political drama follows the path of a power-hungry Frank Underwood (Kevin Spacey) as he attempts to take revenge against those who wronged him. The show has a loyal following and once you watch the show you might find yourself in their ranks as well. This historical drama is a fairly accurate account of the life of Queen Elizabeth II of England. It has been positively received, with its production value, writing and direction receiving special praise. Luke Cage or ‘Power Man’ is another Marvel superhero who gets his own show. After a failed relationship with Jessica Jones, Luke tries to rebuild his life in Harlem, New York. Unfortunately he isn’t left alone and called back into action in order to protect his city. He also has to confront his troubled past in the process. This show is a historical drama about the life of Marco Polo in Kublai Khan’s court. The show starts off slow but the character development and storylines are worth it. It might be just the treat to entertain you while you wait for the next season of Game of Thrones. Brooklyn Nine Nine is a hilarious show about Jake Peralta, played by the supremely talented Andy Samberg, and his police department. The various quirky characters are lovable for the most part and the sticky situations they find themselves are really amusing. Narcos is a Netflix original based on the life of the infamous Pablo escobar who at the height of his career was responsible for around 80% of the cocaine smuggled into the United States. The show features a lot of Spanish dialogue and soon you might pick up a few words of the language as well.